I don’t believe that all good things come to an end. I think all good things evolve and change, and whether they remain good things is up to the universe. If you’ve been wondering where I’ve been, the cat is now out of the bag: I’ve been changing and evolving, and so with me comes this blog. Second Hand Challenge began as just that, a challenge. Could I really shop solely second hand for an entire year? Somehow, with just a few minor cheats along the way, I did it. And I learned a ton along the way. Of those lessons: second hand shopping was not just a challenge for me, it had become a way of life. I love the thrill of finding treasure on the cheap so much more than shopping in a department store or the fast fashion haunts I once loved. Second hand challenged no more- my wardrobe, my home and my life are Styled by Second Hand. On October 1, Styled by Second Hand will be here to share ideas about incorporating second hand elements into your world, and glimpses of how I use them in mine. I’ll share my favorite outfits, DIY home projects, the people and things of the past that inspire me, and hopefully, a new perspective on recycling. I sincerely hope you continue to read and connect with me; please join me on this new second hand adventure. Until then, look for behind the scenes, inspiration and pretty stuff on the following: Instagram, Twitter, Facebook, Pinterest, and bookmark this. See you on October 1! I love me a well dressed man. Who says paying attention to what your wear or enjoying fashion and shopping (gasp!) is “girly”? I know of at least 3 males that read or have read this blog, so I figure, hey, they deserve some second hand love too. My friend Casey is a pretty cool dude- he’s an art director and prominent bass player that hails from Minneapolis/St.Paul and was actually a big part of my inspiration to start this blog. Casey loves to thrift and always seems to find great things. He’s a creative guy, so he’s definitely got the eye for it, but like me, he also enjoys the thrill of finding something great for a little dough. Euro layering- so hot right now. 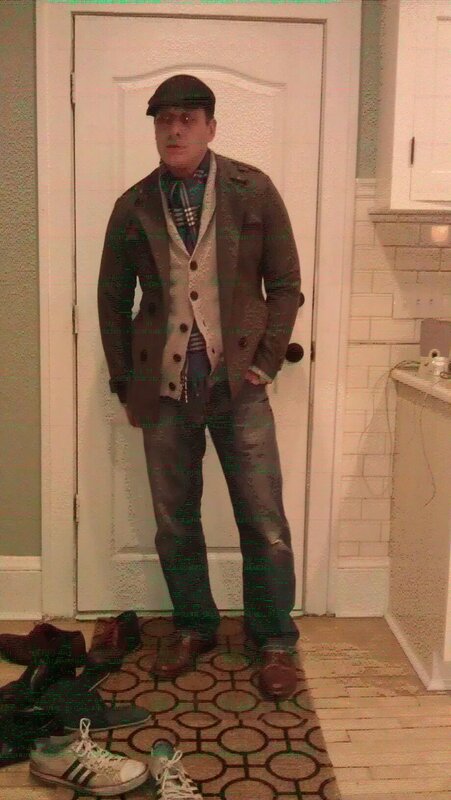 This is a picture Casey posted on Facebook yesterday, which he captioned “euro suit-up.” From head to toe, almost everything is second hand; his coat was $20, sweater $7, shoes $14 and jeans $7. Hat & t-shirt, though new, were steals at $20 and $7 respectively, and the scarf was a gift. The execution of this get-up is spot on from the layering (I’m sure it’s necessary in MSP… brrr) and the accessorizing (love the hat) to the complimentary, natural solids with just a bit of patterning thrown in with the scarf. He looks EXPENSIVE, and the entire outfit cost him $75! 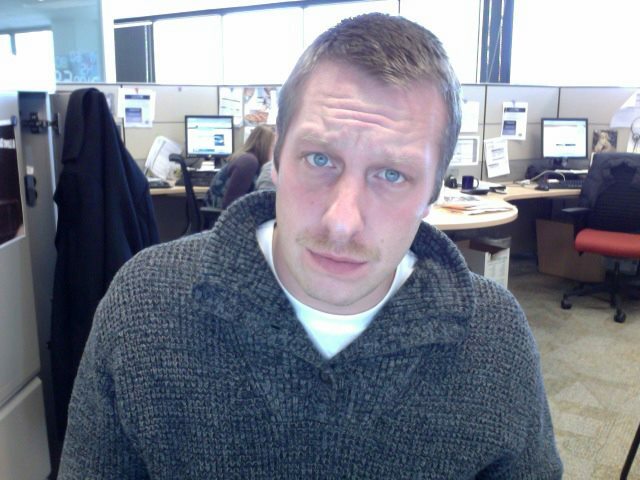 Here are two other looks Casey documented on Facebook while showing off his Movember mustachio progress. 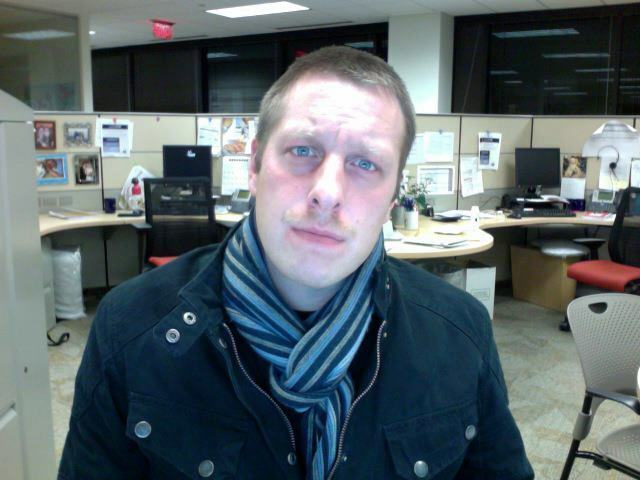 He’s rocking another scarf and jacket combo and a great pullover sweater. Again, both looks are second hand but look nothing less than fab. Money may buy you expensive designer goods, but you can’t put a price on style and a good eye. Snaps for Casey, my second handing counterpart. It’s been almost a month since I started this blog, and let me tell you- it’s been way more fun than I imagined it would be. Not only do I find myself much more of an inspired shopper, but I am a much more inspired writer. The enthusiasm and support I’ve gotten from all of you has been the main motivator in this- I can’t wait to show you what I’ve found. Apparently that’s rubbing off a little and you are sharing things with me, like Tania’s recommendation to head to Costa Mesa’s Goodwill. This whole recycle, reuse and reduce thing just got a whole lot more fashionable and fun, thanks to all of you. Since sharing is caring, I’m going to re-share the shares so we can all share in the second hand love. Jackie, a media planner and Venice Beach resident (read: she’s cooler than me), shared Ramona West, of which I am both thankful and pissed. Ramona West is a online vintage retailer from SoCal that is super picky about the pieces they stock- they want vintage that’s also current which is much easier said than done sometimes. Welp, Ramona knows what she’s doing. So thanks a lot, Jackie, this website will probably be the death of one of my main aims in this challenge- to save money. At least most these clothes are sized for 13 year old boys. Some of Ramona’s looks. Beezus is probably pretty jealous. Joanna, a fellow Anteater/journalist/Costa Mesa resident/second hand aficionado and of course, friend, showed me that second handing for a year doesn’t equal death. Living the Goodwill Life followed Beautiful Existence (yes, that is the name she uses) through 2011 as she solely shopped at Goodwill and saved a total of $13,000! Thanks to the above, I will probably not succeed in saving that much, but this blog is totally inspiring. If this lady can limit herself to Goodwill for a year, there’s no reason I shouldn’t be able to accomplish my task. Like me, Jo has pretty much furnished her entire apartment off second hand goods, most of which were found out at Goodwill. 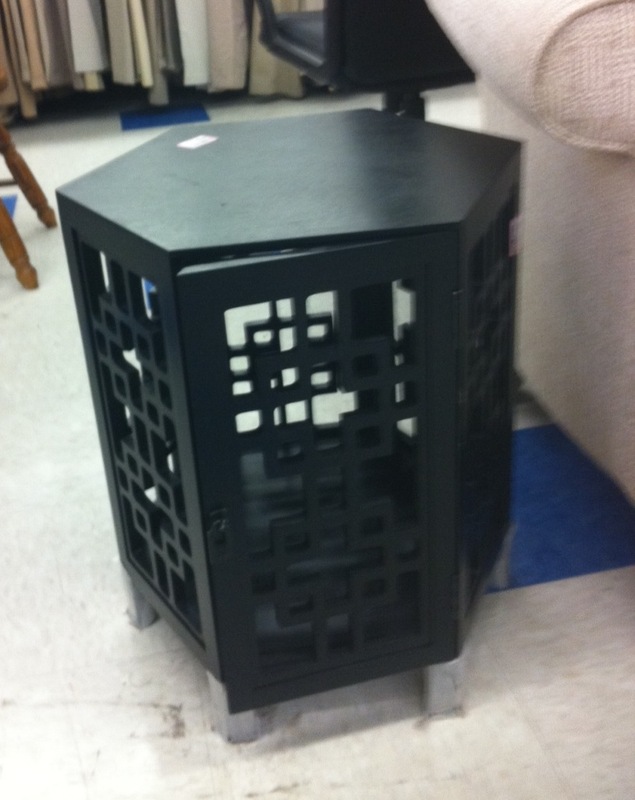 Check out this cute side table she snagged this week for $20. Orly, a fashion professional living in New York (my friends are pretty accomplished, eh? ), posted the Uniform Project on my Facebook wall. The Uniform Project is way more gnarly that what I’m attempting to do. For one year, Sheena Matheiken wore the same dress every day (she accessorized with recycled or donated pieces) as a means to fundraise money to educate kids in the Indian slums. Sheena raised more than $100,000 and with that money, was able to put 287 kids in school. And good karma she got- more than 2 million views on her blog, was in New York Times, London Times, spoke on Ted Talks, was in a gagillion magazines and has now expanded into a year two of projects. Sheesh, Sheena! Makin’ me look like more than a rookie. A giant two thumbs up for the Uniform Project! Orly also had this amazing idea: a clothing exchange. Basically, you and your friends get together and each of you bring items of clothing you’re tired of. Trade. SHARE. Get that top of your friends you’ve lusted after for years. No money is exchanged- only wine, laughs and fashion. SO INTO IT!